When the most recent eruption of Hawaii’s Kilauea volcano started last June, Melvin Sugimoto at first did not think much of it. Hawaii, where he has lived all his life, is made entirely of hardened lava, and Kilauea, perhaps the world’s most active volcano, has been adding more off and on for the last 300,000 years. “Lava is everywhere, but I never thought in a million years it would come through here,” said Sugimoto, who lives in the small town of Pahoa. The source of this eruption is the Pu’u ‘O’O vent, on the vast, mostly unpopulated flanks below Kilauea’s summit. The vent first came to life in 1983, and has since sent dozens of flows seaward. Eruptions have buried some 50 square miles of existing land up to 300 feet deep–much of it in Hawaii Volcanoes National Park, but also along the populous coast, where they have obliterated some 200 homes and 9 miles of coastal road. 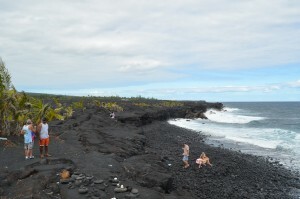 This has added about 500 acres of new land–mostly solid rock, actually–along the coast, where the lava has reached the ocean. Lev’s journey to Pahoa began at a lab at New York’s Syracuse University, where she and colleagues have been trying to understand how things work in nature by making their own artificial lava flows. They get chunks of basalt—the rock formed when lava hardens—and feed it into a furnace. Once it melts, they pour it down a ramp, put various obstacles in its way, and see what happens. They place objects parallel, diagonal and perpendicular to flows, and experiment with different volumes of melt. Once, they put some ice in the way—a crude artificial model for volcanoes in Iceland, which often sit under glaciers. The experiments help confirm observations made in nature during eruptions from Cape Verde to Hawaii. Among them: block a lava flow, and it will often form a bow wave that quickly overtops the obstacle, especially if the obstruction runs perpendicular to the flow. Faster flows form bigger bow waves. Obstacles placed obliquely work better to rechannel lava—but this generally also will speed up the flow, sometimes by as much as 150 percent. Confining a flow to a gully also increases its velocity. 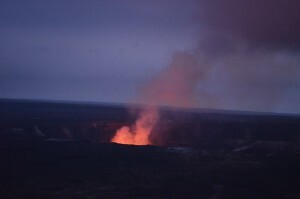 At dusk, a fiery plume dominates the summit of Kilauea, whose eruptions have formed, and destroyed, the landscape for many miles around. Lev traveled to Hawaii in March 2015, and began at the figurative eye of Kilauea—Halema ‘uma ‘u Crater, at the summit. Native Hawaiian religion holds Halema ‘uma ‘u to be the home and body of Pele, the goddess of fire, wind, lightning and lava. For all of human memory, it has been active on and off, and from time to time, it changes form. 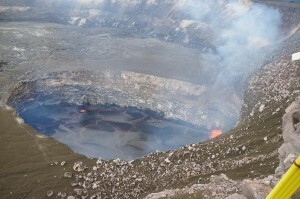 Currently, a deep pit within the crater harbors a roiling lake of lava about 600 feet across, which appeared in 2008 after a series of tremors and explosions. Lava lakes that last so long without draining or blowing up are rare; there are only about a half-dozen known in the world. Lucky for Hawaiians and park visitors, Kilauea is mainly a so-called effusive volcano; that is, its main product is lava. Destructive for sure, but rarely fatal, because lava generally moves slowly enough for people or animals to get out of the way. Worldwide, lava killed only about 100 people during the 20th century. The real killers are explosive volcanoes, such as Italy’s Mt. Vesuvius or Washington state’s Mt. St. Helens. These tend to erupt not lava, but sudden, fast-traveling clouds of gases, ash, boulders and mud, from which there is no escape; these can kill thousands at a time. That said, volcanoes can shift behavior, and there is evidence that Kilauea has in the past exploded. A U.S. Geological Survey observatory overlooking the crater monitors the area all around continuously with seismometers, gas sensors, GPS units, helicopter flights and live cameras. Halema ‘uma ‘u often jets out poisonous gases in the immediate vicinity, so the park keeps tourists at a distance—but Lev and USGS geologist Matt Patrick, armed with special training and tight-fitting gas masks, were permitted to venture within inches of the lip. Here, Lev set up a specialized camera combo to take high-definition video and infrared imagery of the liquid circulating and sputtering several hundred feet below. She and colleagues hope to add to data collected by USGS, and compare it to other active lava lakes in Africa and Antarctica to understand what keeps them bubbling, and not troubling. One idea says that lava slowly circulates to the surface, cools off a bit, then sinks back to be replaced by fresher, hotter material. Another idea is that the lava mostly stays put, but is constantly stirred by streams of gases emerging from below. More sophisticated imagery and measurements might resolve this question. Whatever the answer, Kilauea apparently has a huge, interconnected plumbing system; sometimes the lake level in Halema ‘uma ‘u goes down, and a day or two later, the opposite happens 15 miles away, at Pu’u ‘O’O. This may then cause lava to pour out of Pu’u ‘O’O. 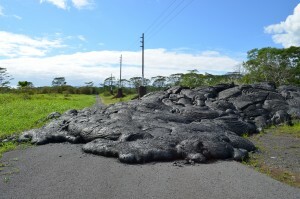 Lava laps across a road near the town of Pahoa. The latest eruption, which started in summer 2014, is not over; it may still overrun larger parts of town. 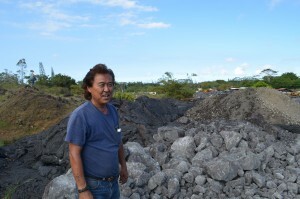 Melvin Sugimoto, a farmer and construction contractor, watched as lava obliterated several acres of his land. He fought back with heavy equipment in an effort to keep the flow at bay. After consultations with USGS staff, Lev’s next stop was Pahoa. The lava flow that started last year has since largely stalled—at least for now. By the time of Lev’s visit, the leading edges had split into two main streams, one lurking in the woods a few hundred yards from the town shopping center and police and fire stations, the other terminating near Melvin Sugimoto’s macadamia-nut orchard. But more lava was still making its way from the faraway vent, and some of it was still piling up and breaking out of older sections further from town. USGS and the Hawaii civil-defense authorities were watching things closely. Lev and her colleagues spent a couple of days walking around on the solidified lava near town. Looming up as high as 50 feet and covering swaths as wide as a quarter mile, it had created its own jumbled topography, with plains, ravines, craters and hillocks. It was treacherous walking—razor-sharp edges everywhere, and occasional thin crusts apt to collapse several inches under the weight of a foot. It seemed more or less cool, but a thermal camera Lev pointed into one deep crack registered 350 degrees C (660 degrees F). “Something is still happening down there,” she observed. Which places got overrun and which survived sometimes seemed just a matter of luck. At points, obstacles had broken the front into separate branches, but then more lava had come from behind, and the branches had recombined. Along a partly lava-covered back road, the local utility company had tried to save its poles by surrounding them with giant piles of cinders, and wrapping them with reflective material. It worked for some—but at least one wooden pole got incinerated, without the lava directly touching it. Lava creates its own topography, but exactly what factors are at work are not well understood. Graduate student Nathan Stephenson at the nearby University of Hawaii, Hilo, helps map a still-cooling flow using GPS equipment. 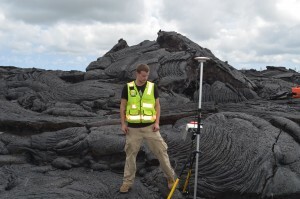 One day, Lev accompanied a team from the nearby University of Hawaii, Hilo, which has been regularly deploying drones to map the topography of the lava and surrounding ground at a fine scale. The aim is to understand how subtle changes in ground elevation and the lava’s own topography may influence its path, and whether manmade defenses can really work. “Thanks to drones, we’re now able to make these maps practically in real time, and track how things change,” said Ryan Perroy, a geographer at the university. Lev plans to deploy drones in her own studies as well. Local people try their best to respect Madam Pele, as many call her. “Ultimately, whatever the volcano, Pele, decides to do is what we will have to obey,” one Pahoa woman told a newspaper reporter in March. “If she wants to flow to the sea and she wants to create new beaches and new lava fields, then we will allow her to do that. 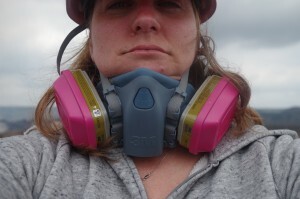 She’s the boss.” That was necessarily the guiding principle a dozen miles southwest of Pahoa, where a series of flows that started in 1990 turned the former seaside communities of Kalapana, Kapa ‘ahu and Kaimu into a barren plain of basalt running into the ocean. 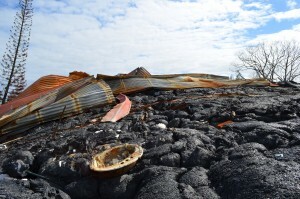 The lone surviving house in the Royal Gardens subdivision of Kalapana was buried in March 2012, its occupants evacuated by helicopter. One of the few places spared was the family compound of Robert Po’okapu Keli’iho’omalu, a patriarch of the local native community known to all simply as Uncle Robert. In 1990, the flow came so close, the family could feel the heat on their faces. They placed Catholic religious objects at each of their land’s four corners, and prayed. The lava bypassed them. Chance? Miracle? The USGS’s Patrick points out that the property was on the waterfront, at the edge of a bay. It might have been spared because the lava entered the bay sideways and filled it like a baking dish, but did not have enough energy to back up and also take the land behind it. The flow created entirely new shoreline hundreds of yards beyond what is now the formerly waterfront property, and the coastal road now ends here. The family has taken advantage of the dead-end location by building a huge bar/restaurant, and hosting a farmers’ market with parking up on the lava flow, where the bay used to be. They have claimed the new real estate for the Kingdom of Hawaii, a sovereignty movement that asserts the United States illegally annexed the islands in the 1890s. The U.S. state of Hawaii says the new land belongs to it. But at least on the surface, no one is fighting over it. The place has become a sort of cult pilgrimage destination overflowing with Hawaiian food, music and old-fashioned aloha. When Uncle Robert died in March 2015, the family put on a three-day public celebration with free meals and entertainment for whoever showed up, and buried Uncle Robert in the back yard a stone’s throw from the lava flow. A massive 1990 flow wiped out the now former seaside towns of Kaimu and Kalapana, building an entirely new shoreline hundreds of yards from the old one, as it met with the ocean. This beach has formed since. Local families have claimed the newly created land for the Hawaiian Kingdom, a sovereignty movement that holds Hawaii was illegally annexed by the United States.